Our culture of inclusion runs deep. Our Patient population is diverse, so it benefits the mid-Michigan region to have a diverse population of health care providers. 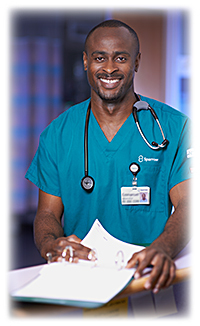 Sparrow's recruiting efforts reflect our interest in building a workforce that offers our Patients more than professional skill. Sparrow established its first Workplace Diversity Plan in 1992. We believe that, through our similarities, we can bridge our differences and enhance our ability to serve a broad Patient base. We are dedicated to promoting diversity and inclusion in the workplace. Sparrow leaders actively work to create and maintain a respectful and engaged work culture. Leadership assessment skills and diversity education are part of ongoing efforts which ensure inclusion at Sparrow. Initiatives like alternative work schedules and leave, childcare, and employee assistance programs—offer ways to fit your personal needs into your work life. Sparrow has partnered with the MVAA (Michigan Veterans Affairs Agency), LAVC (Lansing Area Veteran Coalition), Region 7 - VCAT (Veterans Community Action Teams) and other organizations to become a destination for members of the Military, both Past and Present to work at, and to build a career at. 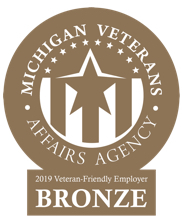 The Michigan Veterans Affairs Agency has deemed Sparrow Health System as one of its 2018 Bronze-level Veteran Friendly Employers based on the initiatives and support our Veteran Caregivers receive. This designation is because Sparrow Healthy System goes above and beyond in the attraction, support, and involvement of our Veteran Caregivers. Sparrow Health System has an Caregiver Resource Group (CRG), dedicated specifically to promoting and improving the experience of our Veteran Caregivers. The Veteran CRG is comprised of Veterans, Reservists, Military spouses, and supporters. This group is an Caregiver ran organization, backed by Sparrow Health Systems and its leaders. © Copyright 2018 Sparrow Health System.